You think bounce houses are for children? Well, they kind of are… But: jumping on bouncy surfaces is silly fun and that is a fact. So why not centre our workout around something known to bring us joy since we were children? If you are screaming “Yes!” internally, exercising by jumping on a trampoline might be your new thing. 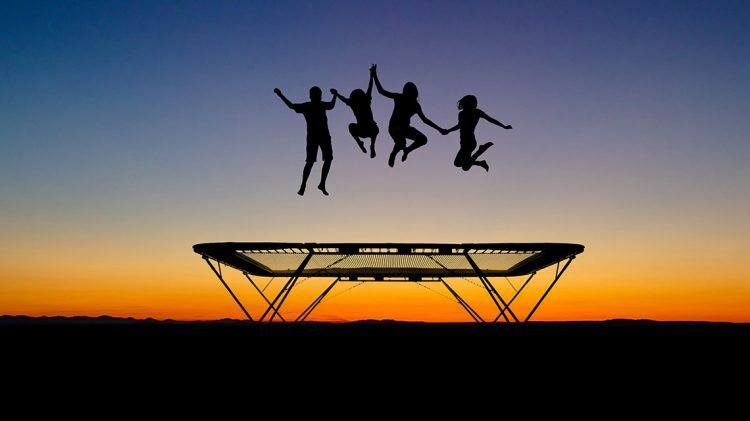 The word “trampoline” etymologically comes from the Italian word “trampolo”, which means “stilt” and might be related to “to trample”. In this case, the original meaning and the actual activity have nothing in common. Just look at the artistic acrobatic figures gold winning Dong Dong was performing at the Olympic Games 2012. While touching the surface only ten times he masters 24 flips and 15.5 twists in 20 seconds, at heights of 30 feet above a seven-by-14 foot trampoline bed! FYI: Far more famous artistic gymnast Simone Biles lands eight flips and 4.5 twists in 90 seconds – when she performs the hardest floor exercise routine in the world. Still, who is familiar with Dong Dong? Are you familiar with Dong Dong? Works for both recreational or competitive use. Modern trampolines were first built by George Nissen and Larry Griswold at the University of Iowa in 1936. They were originally supposed to train astronauts and to be used as a training tool for other sports like diving or acrobatics. But people soon discovered the magic of jumping on trampolines and that is how they became popular. A sport was born! Nissen and Griswold actually had a variety of new games in mind when building the modern trampoline. One of those was “Spaceball”. Here it goes: two teams of two on a single trampoline with specially constructed end walls. The goal: propel a ball trough a middle way in order to hit a target on the other side’s end wall. Sounds a bit like Quidditch for muggles, huh? The “bounce mat“ or “trampoline bed“ is not elastic itself – it’s provided by the springs that connect it to the frame, which store potential energy. Just start jumping, it’s an effective low-impact cardio workout that makes you sweat. You can introduce a proper exercise routine later on, like including modified versions of squats, planks or push-ups using your trampoline. Trampoline is pure fun – not only when exercising for the next Olympics. Go check out if your local gym offers trampoline workouts, get a mini-trampoline for your home or hit up an indoor trampoline park in a city near you. Where would you travel to in time? Why training consistently is a game changer.